The arrival of some more calves has mean that I need to keep on top of the fences at Borough Farm. It’s not that cattle are any more prone to breaking out than sheep, it’s more that when they do break out, they can cause serious damage and are far more problem to return them to their fields. So last week It seemed prudent to repair a section of fence that was decidedly suspect, just a few feet from my fathers prized vegetable garden! It wasn’t a big job although digging the end post into solid rock took a couple of hours, and when the hole was completed I went to find some petrol for the chainsaw, in order to cut a strut to support the post. I should point out that the calves at this point, were 150 metres away grazing contentedly. Retrieving the petrol took just a little longer than anticipated, but even so I was gone for less than ten minutes, so imagine my surprise when on my return I was met by my very agitated neighbour, who reported 24 calves in his front garden, in dangerously close proximity to his new ornate glass porch conservatory, that had been completed just the week before. 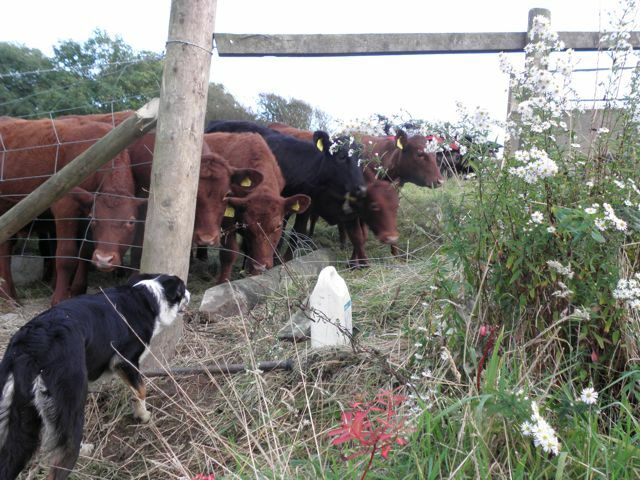 I wasn’t sure quite wether to first retrieve the cows or my insurance policy, but in the event dealing with the cows seemed the prudent option. They were most obliging, drifting gracefully past the glass construction only a couple of feet away, while my neighbor looked in a visible state of shock! 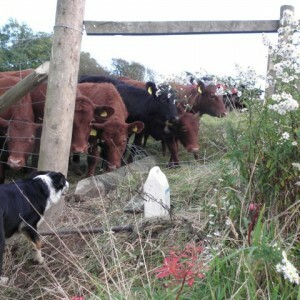 I finished the repair to the fence that evening, the calves had escaped through a gap of only four feet wide. Quite why they had decided to trot right across the field and up the farm drive the moment that my back was turned remains a mystery. There is a rumour that Zola saw that I had walked down to the farm yard and decided that the calves ought to come with me but it’s s rumour that both Zola and I completely deny.